Delivering lower cost and added-value to the customer are the key factors driving hardware development for suppliers of fibre-optic test & measurement and network equipment. The improvement of existing techniques in assessing the health and transmission quality of optical fibres allows for dramatic reductions in the price and size of such maintenance instruments. As a consequence on-line monitoring of the physical performance of fibre-optic links has becomes a more economic option for METRO applications and campus networks, hitherto an area where only sophisticated and expensive test equipment was applied in the past. The need to continuously improve the safety and reliability of optical communication networks calls for extended options for network surveillance. On the one hand, limited financial resources restrict the introduction of ever more surveillance devices and more expensive test equipment. Consequently, lower cost and added value are the driving factors in hardware development for fibre-optical test & measurement and network equipment suppliers. Different instrument types at certain price levels have been developed to gather the full range of information. These range from simple connection tests to the measurement of polarization or chromatic dispersion. Instruments of higher cost typically also include the functions of the cheaper devices. At the top of the list of requirements towards zero-downtime networks there is the necessity of characterizing the health and transmission quality of the optical fibres themselves. An optical time domain reflectometer (OTDR) is the instrument of choice. This provides information regarding the losses in the fibre at any distance required allowing checks for defects, kinks and breaks. Nonetheless, online monitoring of the transmission behaviour of the fibres is restricted because of the high costs of OTDR-based systems. For instance Nettest, Acterna and EXFO released solutions using these surveillance systems in 2003 at prices of greater than US $ 50,000. These instruments are used to locate faults once they have already occurred and the network is down. Simpler and cheaper instruments like OTDR-based fibre-break locators have restrictions in their sensitivity and most can only determine the distance to a major fault. Hand-held link verification tools provide no information at all about the distance to the break. So again there is no way of online health checks. More than 20 years ago work began on trying to simplify the standard OTDR principle. An OTDR works by launching short, high intensity optical pulses into optical fibres. This high intensity is needed to obtain a high dynamic range and a good signal-to-noise ratio. However, the high intensity is also a drawback. Higher peak power means limited availability of cost-efficient laser sources and more noise by increasing non-linear effects within the fibre. One way of modifying the pulse-OTDR principle is to launch coded, low-power pulse trains into the fibres instead of super pulses. Spatial information is then achieved by correlating the transmitted code trains with the backscattered trains from the fibre, see Figure 1. Pulse trains consist of sequences of digital states “0” and “1”, represented by low laser light power and high laser light power. They are sent at a cycle frequency chosen from the kHz range up to several hundred MHz, depending on the desired spatial resolution. Different pulse trains are referred to as ‘correlated’ if their code sequences of states 0 and 1 are equal. Correlation-OTDR code sequences of a special type are the so-called pseudo random number sequences. Two different pseudo random number sequences can never correlate, because their states are chosen randomly. Only if an emitted sequence is stored in memory and compared to the exact twin of the sequence, backscattered from a reflection in the optical fibre, a correlation can be found. Information about the distance to the reflective fault in the fibre is achieved in the following way. It first takes time for the emitted and stored sequence to travel down the fibre, be reflected, travel back and then to arrive as the twin of the stored sequence. With this time delay ‘t’ is quantified and the speed of light ‘c’ in the fibre, the distance ‘m’ of the fault is calculated: m = 0.5 * c * t.
The smart idea behind the modification is to achieve the same sensitivity as with pulse-OTDR because the time-averaged launched powers are identical, but the peak power is lower. In the beginning, however, solutions using this new method suffered from very long signal averaging times when backscattered signal levels were weak. This was caused mainly by the fact that fast detection electronics and powerful microprocessors were not available at that time. As a consequence, the market demands for the correlation-OTDR as a substitute for pulsed-OTDR could not be fulfilled and this prevented the market break-through for simpler reflectometer variants. Fibotec Fiberoptics is a solution provider to customers involved in fibre-optic communication applications, fibre-optic test & measurement applications and fibre-coupled laser diode subsystems, which are used for graphic arts. 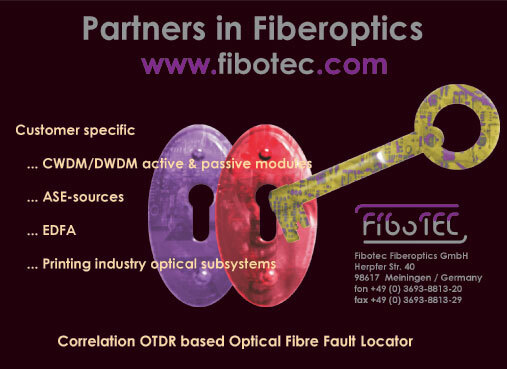 Partnership with OEM-customers has resulted in the majority of products shipped by Fibotec being specific fibre-optic modules, from slot size to that of 19" rack-mounted devices. Contacts with and requests from equipment manufactures triggered Fibotec work in re-examining the benefits of the correlation-OTDR principle to build a reflectometer that was sufficiently cost-effective and small enough to fit network needs of online monitoring. Nowadays, sophisticated algorithms and fast application-specific digital electronics simplify proper pulse coding; so backscattered signals of orders of magnitudes weaker than the sent signal train were no longer an important issue. Moreover, the constant progress in semiconductor component technology has resulted in the simplification of the design to produce compact and cost-efficient instruments, compared to the situation a decade ago. Fibotec has spent the past year adapting the correlation-OTDR principle to today's requirements for sensitivity, dynamics and measurement speed - by exhausting the potential of fast analogue signal detection circuits and programmable logic devices. The company’s investment in this technology has resulted in impressive technical results and an excellent cost/performance-ratio. The device was finally called a fault locator, because it sells at the cost level of miniature OTD reflectometers and below. Dynamics and sensitivity however are much improved. This makes it possible to observe back-reflections down to -100 dB at a reasonable average time of less than a minute. The hardware correlator also enables the reflectometer for true online monitoring. The dynamic range of 40 dB is much improved compared with competing low-cost pulse-OTDRs. In the field, the device allows for the testing of up to 150 km of optical fibre by applying a 3 dBm test signal. Resolution depends on the observed total fibre length. However, a zooming function allows for approximately 1m resolution at any given distance. See Figure 2 for a typical measurement result. The link shown is of a two high-attenuation single-mode fibres. A first fibre of approximately 14km length and 20 dB attenuation and a second fibre of approximately 7km length and 10dB attenuation, linked and terminated with FC/PC connectors. The black curve is a result of 50 averaged single measurements. The second peak in the figure at approximately 21km is caused by a 4% glass reflection from the open FC/PC connector. Total attenuation of the back-scattered signals from this reflection equals to -74dB. The first peak at approximately 14km corresponds to the closed FC/PC connector between the two fibres. The low peak-height is expected because of the known low return-loss of FC/PC connectors. The size of the fault locator with standard specifications as a module version amounts to 100x170x17 cmm, see Figure 3. The concept of correlation-OTDR is rather smart and simple in theory. In practice, one is dealing with the problem of executing rather time-consuming operations before backscattered signals can be identified and spatially resolved. These operations include analogue-to-digital conversions from light to digital electronic signals and the calculation of the correlation quality of the stored and received pulse trains. In the past, these calculations were far from being executable in real-time, i.e. at the rate of the incoming pulse trains. There are three key elements in Fibotec’s correlation-OTDR, which allow full real-time operation: the analogue-to-digital converter is a fast one bit type, which operates without feed-back loops for offset control. The correlation calculations are hardware-coded on a digital basis, so no computer programme is running to execute calculations. The hardware allows for the detection of infinitesimally low back-reflections, which is only limited by the measurement time. It is intended that systems integrators might embed the module version of the correlation-OTDR in their own fibre characterization platforms and then run it using their own specific software interfaces. It is expected that suppliers of WDM systems for example, could now offer reflectometer-based surveillance solutions to their customers. Such online monitoring features will use either a free WDM channel or will operate at any wavelength outside the traffic wavelength grid. No downtime during measurements is now necessary. It is possible to detect some types of failures already before the link fails. Because the correlation-OTDR fault locator is equipped with low-power laser diodes, it is highly flexible regarding the operation wavelength compared to standard OTDRs. This allows not only standard out-of-band monitoring at free WDM channels or at 1625nm, but at any wavelength where low-power fibre-coupled laser diodes are available.